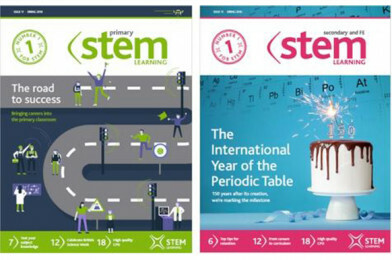 Keep an eye out in school this week for the new editions of STEM Learning magazine! Both Primary & Secondary editions are full of insightful articles, practical resources and upcoming CPD for your summer term. In the primary issue you can find advice on how to celebrate British Science Week in March, bring careers into the primary classroom, and so much more. In the secondary issue, there’s a celebration of 150 years of the Periodic Table, you can discover the new consortium for a world-leading computing education, and delve into the science of learning. Click here to access the online editions!